Transcription work is where many people who work from home get their start, including myself. It’s a good way to get your foot in the door, so to speak. You learn to manage your time and your money, while gaining valuable skills that can lead you to bigger opportunities, even in transcription! Once you gain some experience at an entry-level transcription job, you’ll qualify for better-paying opportunities. Even if you don’t want to stick with transcription for the rest of your life, you’ll still gain work from home experience that many remote job employers look for. And, transcription work can be just what you need to get you through a tough financial time. I was in that position a few years ago, and I decided to try out a highly-rated transcription company. I didn’t make enough for a full-time income (of course, I was just a beginner, like you! ), but I made enough to help my situation, which was my goal. So, try out these general transcription jobs with no experience needed. Whether you’re looking for a pathway to full-time income or just a little side cash, these companies can help you get there. 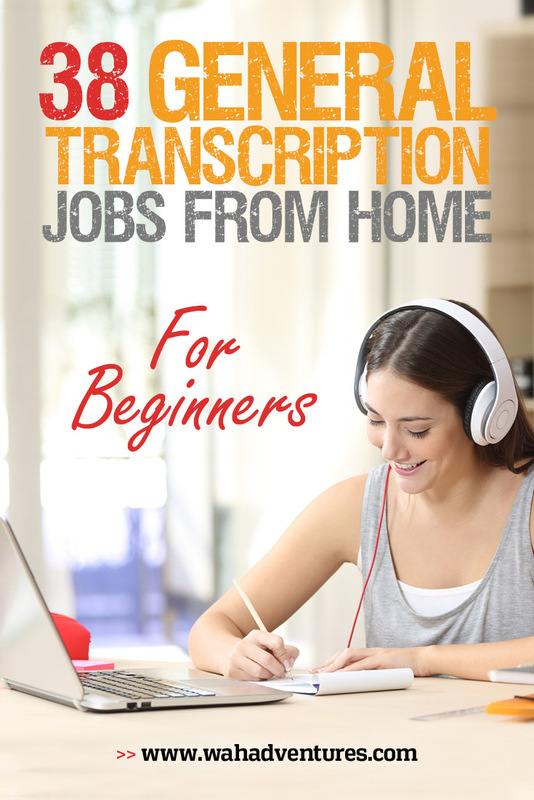 These general transcription jobs are all ones you can work from home, no experience necessary. Foot pedal. You can use a foot pedal to start and stop playback, so you can continue to type without interruption. Quality headphones. A quality pair of headphones will drown out background noise in your home, while also helping you audio more clearly. Transcription software. A good transcription software can help you playback audio and video files at different speeds, supports different file formats, loads audio and video files from the internet, and more. Express Scribe is one most transcriptionists recommend, and it has a free version. You should also consider signing up for PayPal if you don’t yet have an account. The majority of these transcription jobs pay with PayPal, which is a fast, easy, and convenient way to get your money. 1-888-Type-It-Up (review) has experienced transcribers on its team, but states that it looks for “new talent” as well. As long as you can pass its transcription test, follow directions precisely, and meet its accuracy, formatting, and reliability standards, you can gain a spot. You must be a United States resident to become a member of the team. The pay ranges from $36 to $180 per audio hour, depending on turnaround time and sound quality. The company also pays bonuses that are file-specific. You’ll get paid twice per month via PayPal, on the 15th and the last day of each month, but you must remember to send an invoice. 1-888-Type-It-Up requires you to have the free version of Express Scribe, headphones, and a foot pedal. To work with 3 Play Media (review), you don’t need transcription experience, but you do need word processing experience. You’ll also need to have an excellent command of the English language, both written and verbal, and use proper grammar, spelling, and punctuation. This company doesn’t require you to have any transcription software or equipment, but your computer should have at least a 10 Mbps download speed. Pay is project-based, but usually in the $10-$30 per hour range, depending on how fast you work. Must be a U.S. resident who can commit to about 15 hours per week. Accutran Global (review) constantly looks for new transcribers for an entry level opportunity. The company hires U.S. and Canadian transcribers. You must be pretty flexible, as Accutran Global requires you to complete assignments with quick turnaround times. Pay is $0.005 per word, with opportunities for pay increases, and payments are made on the 15th of each month. You’ll have to complete an application and pass a transcription test to qualify for a position. If you’re interested in a transcriber position with Accutran Global, you should be able to set aside at least 3 hours per day. Peak periods through the year usually offer much more work than non-peak periods. Allegis looks for independent contractors to complete transcription work for its clients. The company has openings for experienced, entry-level, legal, medical, and other transcription work. Entry-level positions require you to go through a training program for two to three hours daily for up to three weeks. Upon successful completion of training, you can qualify for independent work from clients. You must also be able to type 75 WPM, be open to constructive feedback, and be able to meet the required deadlines for each project. Alorica has a variety of work at home jobs for remote workers, as the company provides various services remotely to businesses all over the world. Transcription is one of its popular services, and you can join the team on a part-time or full-time schedule, depending on available projects and clients. Some of the more technical transcription jobs are ones Alorica posts only on Indeed and other job search sites rather than its website, so you’ll want to look on those sites too. A current one that’s available, for example, is for captioning for the deaf and hard of hearing for phone services. Alorica offers a wide range of benefits for its employees, including paid time off, paid training, discounts through client programs, and medical and dental benefits. Not sure what Amazon Mechanical Turk is? We have this whole post about what it does and how to use it. We also have another helpful post on other sites like Amazon Mechanical Turk on which you might also be able to find similar gigs. The site is known for its quick tasks, but it also has both short and long transcription work available. The longer the task, the more it’ll pay, on average. The thing I like about this site is that it’s very flexible with your schedule. You can pick when you want to log in and find work, and you’ll also choose what work you want to complete. Browse specifically for transcription work and pick the ones that you can complete during your open schedule and match your interests. Some requesters might require transcription experience, but if you think you can handle the job, you can still begin working. Just note that the requester will have the final say whether the work gets approved, so make sure you’re completing it to his or her standards. You can apply for Appenscribe (review) transcription work with a quick form on its website and a few simple tests that examine your accuracy with English or your native language. The company hires transcribers from all over the world, and the more languages you’re fluent in, the more work you can receive. Appenscribe asks that you commit to about 10 hours per week, but tasks are fairly flexible. The exact pay isn’t mentioned, but workers say they make equal to about $0.005 per word. Your transcription accuracy must be at least 85% to receive the full pay amount for a file. You’ll receive pay every 2 weeks via PayPal. Babbletype (review) is one of the most popular general transcription companies because it offers excellent flexibility. This company lets you sign up for any assignments you want up until 4pm each day, as long as you can complete them by 4 pm the following day. There is no hourly commitment or schedule each week. You must have strong proficiency of your native language, be reliable, and have a computer with a good internet connection and good headphones. As part of the application process, you’ll be required to complete a series of tests that can take about 3 hours total. Although there is no specific pay rate listed on the website, pay is said to be around $40 per audio hour. Babbletype pays via PayPal every Thursday. Bam! Transcription (review) doesn’t offer a lot of information on its website, other than it specializes in entertainment transcription. Most beginner transcriptionists can complete this type of transcription work at an entry level. And, the company only requires that you pass a basic skills test to get hired. Project turnaround times vary between 24 hours and several days. The pay rates aren’t listed on the website, but you can contact the company via its contact e-mail address for more information. Birch Creek Communications (review) hires independent contractors as transcriptionists. Although it specializes in corporate and legal audio files, there is general legal transcription work that general transcriptionists can complete. For this work, you’ll receive $0.75 to $1.75 per page of audio transcribed. You can accept jobs whenever you’re able to work, but most of the work comes in during normal business hours Monday through Friday. Projects have between a 24 hour to 5-day turnaround time. You must be a United States resident to apply. You can send the company a resume via its website, along with your availability and the type of internet connection you have. Caption Matrix (review) is an international company that hires English transcribers as well as bilingual workers in a variety of languages. Caption Matrix is highly interested in you if you speak multiple languages. Most of the work completed is in the form of transcribing videos such as documentaries, presentations and instructional videos. CastingWords (review) transcribers are independent contractors from all over the world. You can set your own, flexible schedule, only taking work when you’re able to complete it. Other freelancers or CastingWords editors will grade your work, and if it meets requirements, you get paid for your work. There are also bonuses available for some more difficult audio files. Your grades determine how much work you receive, as some work is only available for certain levels. Pay rate depends on the quality of the file, with easier files paying about $0.60 per audio minute, and $1.20 per audio minute for more complicated files. Pays every Friday with PayPal, although funds may take several days to transfer. Crowdsurf (review) hires freelance transcriptionists to transcribe video into captions for the deaf, hard of hearing, and language learners. The company offers short transcription tasks that let you create a flexible working schedule. CrowdSurf used to use Amazon Mturk to post its jobs, but now uses Work Market, a marketplace for companies to manage their workers. Once you sign up on Work Market, you can join the Crowdsurf team by completing some questions and a brief assessment. Payment for these tasks will be low, since they are very short tasks, mostly under a minute. Pays via direct deposit or PayPal. Daily Transcription (review) specializes in legal, corporate, and entertainment transcription, with entertainment clients making up the majority of its client base. It requires most of its transcription work to be required within 24 hours, which is the reason behind the company name. Work fluctuates with Daily Transcription and it assigns its work on an “as-needed” basis. You are required to have a foot pedal and headset. To apply, you just have to fill out a short form on the website and take a quick assessment to prove you have the transcription skills necessary for the position. Payment rates are not listed on the website, but workers report getting paid every two weeks via PayPal. eScribers is a reporting and transcription company that helps clients in the legal field. Transcribers need to type at least 70 WPM and be comfortable working on legal cases involving US immigrants and their families. Prior transcription experience is preferred, but not required; the company is willing to look at all applicants who possess the right skills. You’ll need to be legally allowed to work in the US, have a current US bank account for payments, and have native fluency in the English language. You can work from home helping FF Transcription meet the workload needs of its clients. The starting pay is $0.40 per audio minute, but the more work you do (and more skills you have) for the company, the higher your pay can go. There are also bonus opportunities available for the right workers. You’ll need to take a skills test along with your application before getting hired. FF Transcription should let you know within two business days if you made the cut. Can’t find a place that feels right for you and your transcription work? You can always go the being-in-control route by signing up for Fiverr and creating your own jobs for others to buy. I know several freelancers who use the platform as a method of finding people to fill in their dry spells between client work, so that’s something for you to consider too. Fiverr is a buying and selling platform where people offer their services – designing, development, writing, and more – for others to buy. Your gigs can start at $5 but can be more depending on what you’re offering. For example, you might offer to transcribe a 1-minute audio clip for $5, but charge $50 for a 15-minute audio clip. The choice is yours because you’re in control of your listings. Once you get a few buyers and good reviews under your name, you should start seeing your transcription services bloom on the platform. Transcribers and Reviewers are often hired by Get Transcribed (review). They pay every month via PayPal as long as you have $100. Transcription work is paid at a rate of 23 cents per audio minute and reviewers are paid 12 cents an audio minute. If you do review your own transcription work then you will be paid 35 cents per audio minute. GMR Transcription (review) hires general transcribers with medical backgrounds or for a variety of other topics, like academics, legal, or business. It offers a quick quiz you can take before you apply to ensure that you’re a good fit for the GMR Transcription team. Pay rates are not disclosed on the website, but it does state that they’re based on turnaround time, quality of audio, the number of speakers, and difficulty. To apply, you can send your resume to the contact listed on its careers page. After you submit, you’ll receive an e-mail to take the qualification test. GoTranscript (review) only requires that you have excellent English skills to become a transcriber. The company hires transcribers from all over the world to work a flexible, choose-your-own assignments schedule. GoTranscript is one of the best for entry level transcribers because it has very little requirements, including typing speed. The company will give you 6 hours to transcribe 10 minutes of audio, which is plenty, even for new transcribers who are still learning. You’ll get paid up to 60 cents per audio minute, depending on the difficulty level of the audio. Pays via PayPal or Payoneer every Friday. Hollywood Transcriptions (review) has clients in the entertainment, academic, legal, and corporate fields. It doesn’t require you to have transcription experience, but you must be able to type 65 WPM and have a reliable computer with internet connection. You must also have a foot pedal and transcription software, but you don’t have to purchase these until you are hired. Pay rates aren’t listed on the website. However, some transcribers who do several hours of work for Hollywood Transcriptions each month report making between $100 and $500 per month. You can apply via a quick form on the website, where you can also attach your resume. Kendall Creek Communications comes from the same people over at Birch Creek Communications, so it operates the same way. The company uses entry-level transcribers to complete its client work. Although experience isn’t required, you should indicate any experience you might have had in your application, and certification is a huge plus. You’ll need to go through a screening process if you’re determined to be a candidate based on your application. It involves a few tests followed by a probationary period at the minimum pay rate. After that, you can move up to a boosted pay rate and more work. If you have some experience with legal terminology, you can become a transcriber for Neal R. Gross (review). This company specializes in court transcriptions, where you’ll need to transcribe audio files verbatim for court reports. This position will require a 30-hour commitment per week, so it may not be the best option for those looking for a very flexible schedule. You also must be able to transcribe at least 5 hours of audio within your 30-hour workweek. To inquire about pay rates or a position with Neal R. Gross, you can e-mail the company with the address listed on its website. You will be required to take a transcription test before you’re hired. Quicktate (review) hires independent contractors to transcribe voicemail messages, letters, phone call recordings, conference calls, and more. The company requires you to follow instructions precisely and have an excellent command of your native language. You’ll have to pass a series of tests to become a transcriber for QuickTate. You’ll also need to provide 3 references along with the submission form. Quicktate pays ¼ cent per word for general transcription. As you gain experience, you may be able to earn ½ cent per word for more difficult transcription work. Pays every Monday via PayPal. Rev (review) is one of the most popular places for work from home transcription jobs. With Rev, you can work as often, or as little, as you want, with an entirely flexible schedule. It’s a great place for beginners because you’ll receive regular feedback from Rev editors on your work. Rev pays between $0.40 and $0.65 per audio minute with average earnings of $241 per month. You’ll receive payouts every week via PayPal. Rev suggests setting aside one hour for the application process, as you’ll be required to complete a test at the end of your application. RNK Productions (review) hires at-home transcribers to transcribe audio from video files to create captions. RNK Productions works with a number of TV shows and movies, so you could be transcribing some of your favorite pieces of entertainment. The company requires that you are very accurate and reliable, although the website mentions no specific schedule or hour requirements each week. You’ll also need to be able to control audio and video playback simultaneously to transcribe. To inquire about pay or submit your resume, locate the e-mail address in the Job Opportunities section of the RNK Productions website. Scribie (review) lets you work from home on your own schedule with no monthly hour commitments. With Scribie, you’ll be typing or dictating your audio transcriptions of very short files of 6 minutes or less. Pay is between $5 and $20 per audio hour, which is lower than many other transcription companies. However, you get to pick and choose what you want to work on, so you don’t have to accept a file that you think will be too difficult for you. After every 3 audio hours you transcribe, you’re eligible for a $5 bonus. Scribie also has a referral system allowing you to make money by referring your friends. You can withdraw from your account to your PayPal account once per day. Formerly SpeechInk, SpeechPad (review) offers flexible, general transcription jobs with no set schedule or number of hours. SpeechPad requires you to be able to type at least 40 WPM, and be fluent in English, with good grammar and understanding of dialects. You’ll also need a reliable computer with internet connection and headphones. A foot pedal is recommended, but not required. The more qualifications you acquire through SpeechPad, the more jobs will be available to you and the more you can earn. You’ll also be rated for the quality of each of your jobs. Pay ranges between $0.25 and $1.00 per audio minute. High ratings can earn you bonuses. Pays every Friday via PayPal. Tigerfish (review) offers flexible transcription positions to those who want to create their own schedules. Although you don’t need to have experience, you’ll be required to study the Tigerfish style guide and adhere to it as you transcribe three files as part of the application process. You’ll also have to fill out a form with your information, availability, etc. Tigerfish offers turnaround times of a day or more for most projects, but will assign those available with rush projects due quicker than 24 hours. You must have a foot pedal and transcription software to work with Tigerfish. You’ll find out more about pay rates after you apply. Although Transcribe.com (review) mentions on its website that “experience is a plus” and may move you along faster within the system, it’s not a requirement. As long as you have an excellent command of the English language and can pass the transcription assessment, you can gain a spot on the team. Typical turnaround times range between 24 hours and 7 days, and you are allowed about 20 hours per week to work. Pay rates are not listed on the website. However, it does state that you’ll only get paid for acceptable work that meets the guidelines. Transcribe.com pays via PayPal daily. You’ll need a foot pedal and transcription software if you’re accepted to work with Transcribe.com. You must reside in the U.S. and speak English to get approved. Transcribe Team (review) accepts new transcribers to work from home with a flexible schedule, working as much or as little as you want. The only things it requires you to have are a computer and reliable internet connection. The audio files you’ll transcribe vary greatly, so you can potentially have a new experience every day. The website states that the company usually has steady work available for you. The pay rate ranges from $0.40 to $1.25. Pays weekly via PayPal. TranscribeMe (review) states on its website that it welcomes beginning transcribers as long as they have excellent English and typing skills. For this company, you’ll be transcribing very short audio files, between 8-10 seconds, so it’s an excellent start for the entry level transcriber. TranscribeMe hires from all over the world. You won’t need special equipment, but it does require you to have the Google Chrome browser. You’ll get paid $20 per audio hour, which can take a while to reach, considering you’ll transcribe such short pieces of audio. Still, it’s an excellent way to gain some experience and make some side income. Pays weekly with PayPal. You are not required to have any experience to join Transcript Divas (review). However, it does specify that it holds its transcriptionists to high standards and expects the utmost quality for each job. You’ll also need to be available for quick turnaround times, as fast turnaround is one of their most important company features. Pay rates are not listed on the website, but transcribers for the company report pay equivalent to between $11 and $18 per hour. You can complete a short form online to apply and, if approved by human resources, you’ll receive a phone call for more information. Transcriptions ‘N Translations has its team complete transcription work for popular television shows. No experience needed, but you’ll have to pass a basic skills test to qualify. This website has very little information about the job, but you can inquire about more information when you apply via the short form on the website. TSI Transcripts (review) hires transcribers who have a high level of understanding of computers. Multilingual abilities is a plus and of course it is expected that you can type at a speed of at least 70 WPM. Ubiqus (review) has a wide range of clients who submit transcription projects to the team, from medical to corporate. It’s not required that you have any experience, but if you have excellent availability and can provide quick turnarounds for projects, you may gain preference over others. Ubiqus hires U.S. residents who can type at least 70 WPM. Payouts are made every two weeks via PayPal. The company reportedly pays between $0.005 and $0.007 per word. Verbal Ink (review) doesn’t provide a lot of information about its transcription jobs on its website. However, it does state that it is “always looking” for people to join the team, as long as they are “highly skilled linguists”. So, having an excellent command of your language will land you a spot more easily. You also need to be computer savvy and be available for quick turnaround times. You can apply via the e-mail address on the website. Send a resume and your availability, along with a cover letter. If you move onto the next part of the application process, you’ll be required to take a test, which applicants have reported as being difficult. WeLocalize looks for remote workers to complete transcription and translation work for global companies who need audio content in written form or translated to other languages. The jobs are all freelance opportunities and cover a variety of languages, so they’re best for bilingual transcriptionists. Some positions will require proper experience, while others don’t. Those that do might waive those requirements with proof of your skills during the application and screening process. Not Finding the Right Transcription Work for You? I often tell people that if they can’t find exactly what they’re looking for with at-home jobs from lists like these, then use Indeed as a second source. Indeed is a job search site that’s 100% free to use, yet tends to have the most comprehensive assortment of jobs in almost any industry. It’s also super easy to find remote and home-based work in any category you’re interested in. To do this, head to the site and type in a keyword for the type of job you’re looking for in the “What” search bar. Indeed will then only search its database for those types of jobs that you can do from home. It’s not foolproof, but it usually leads to excellent results that you can use to shape your job search. I’ve used it myself to research jobs for curated lists like this one and to look for writing jobs for myself, so I can say firsthand that it works. Another thing I love about Indeed is that you can create a free account to save interesting jobs you find to refer to later. You can even create job alerts for searches you frequently use and Indeed will send new jobs right to your email! On the sidebar of your search results, Indeed will show a message inviting you to enter your email address to receive job alerts for that category. You’ll never miss a new transcription job posting again! These transcription companies are excellent places to get your feet wet in the transcription career. Not only can you do them in the convenience of your own home, but most are very flexible, so they can work around the schedules of you and your family. If you’re very serious about getting your transcription career running quickly, I highly recommend Transcribe Anywhere (review). This company’s focus is to help beginner transcribers gain the skills needed to move forward with their careers. Transcribe Anywhere even offers a free, 4-day course to help you understand the basics of transcription. If you know of any general transcription jobs for beginners I missed in this article, please let me know in a comment below! Never heard of Get Transcribed or Type it Up, I’ll have to check it out. Does Get Transcribed mail you a foot pedal if you don’t have one? I know some places are willing to mail you one and take it out of your first cheque or do a payment plan thing. Hi Miranda, I have been your blog’s feed subscriber for long and always read the entire blog posts. You inspired me to launch my own domain blog in WP. I am going to mention this blog post of yours. This list of transcriptions sites is new to me. I wonder where I have been in the online money world! Thanks Badri! I love your site! http://transcriptionessentials.info/ and speechpad.com seem to be okay, when it comes to general transcription. They have enough work and the grading and payment is fair too. hello how to get it in, in this kind of job? Does anyone know if you can be a transcription job if you can type only 55 wpm? I wonder if they accept entry level applicants. This is awesome Amy. Thanks for sharing these resources with us. I know there are a lot of people who don’t have much experience so this will be very helpful. Passing this along. Have a great weekend! This is such a helpful website! Thank you to whoever created this! Excellent resource for people looking to work from home and make some money online. Thanks for sharing. I want to work in this field . I once worked for a US based company called TranscriptionWing, https://www.transcriptionwing.com, but they only accept Filipinos. So if you’re from the Philippines or currently a digital nomad residing here, you should give it a shot! They pay really well.